It’s hot, our electric bills are jacked up due to the use of air conditioning, girls are wearing the bare minimum, and I just saw a hot rock show at an art museum. Summertime has officially rolled into Los Angeles! One pretty damn awesome thing about LA is its appreciation of the arts in all of its wonderful forms, colors, shapes and sizes. Another damn awesome thing about LA is its penchant for using its fine museums to provide a platform to display and enjoy said art forms come the summer. 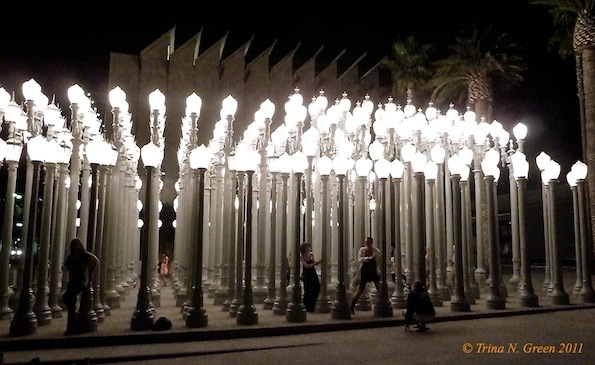 On Thursday the Los Angeles County Museum of Art (LACMA) kicked off its newest concert series in conjunction with the residing Tim Burton exhibit, showcasing the best in emerging musical talent and providing after hours access to the art exhibits. 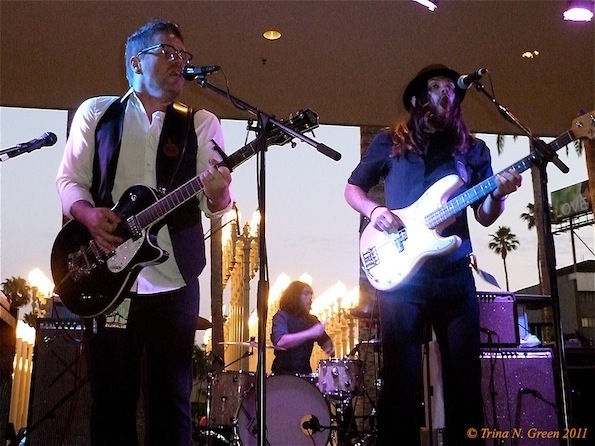 The musical stars of this eve were composed of the combined badassery, Los Angeles’ Saint Motel and San Diego’s The Silent Comedy who just so happen to have just kicked off their two month co-headlining Summer Sweat Tour graciously making LACMA show #3 of the tour. Two bands of very different and distinct musical sensibilities, but damn if they aren’t made for each other. Taking the stage first was The Silent Comedy, whose genre-blending sound of folk, rock, and Americana had those museum patrons who were wandering about aimlessly redirect their attention to the finely dressed, well-mustachioed gents on the stage. Their eight-song set pulled not one punch as hands got a-clapping, feet began a-stomping, and spirits were a-lifted by the energy The Silent Comedy generates in their live show. When these boys take a stage it’s nothing short of an “experience” that must be seen and felt to be believed. 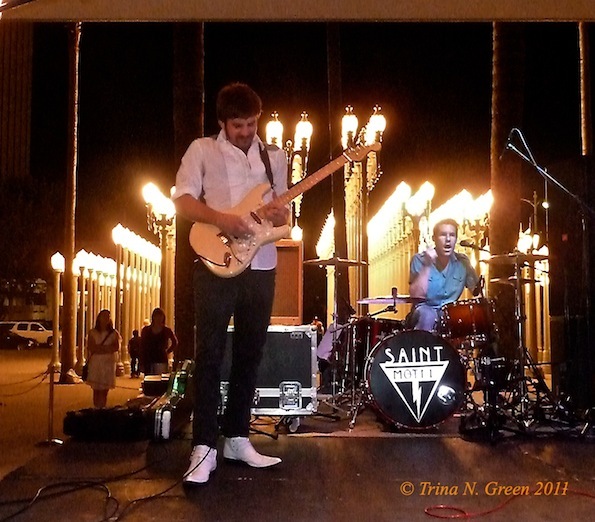 Ambitious and artistic by nature, Saint Motel was about as at home as could be in the museum setting. 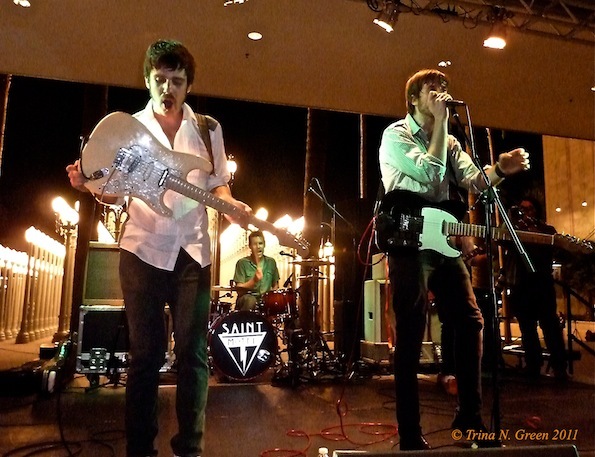 It’s not the first time that they’ve performed in one and they showed why they’re one of LA’s best bands and seriously poised to blow up nationally (no exaggeration there, folks). Nine songs of their kaleidoscopic garage pop/rock such as “Butch”, “Eat Your Heart Out”, and the annoyingly stuck-in-your-head-for-days “Puzzle Pieces” were what the pretty ladies came to see, hear, and rock to and none were disappointed. Oh, and there was a bonus that may have flown over the heads of anyone born in 1991 and beyond, and it came in the form of a brave and more than serviceable cover of The Who tune, “A Quick One While He’s Away”. After the show, patrons had an additional two hours to get their art on at the Tim Burton exhibit. Now this is high culture, folks. I’m so glad that I live in LA.